MXenes are emerging 2-D materials that are extremingly promising for applications in electronic and energy storage devices (Science 341, 1502, 2013; Nat. Commun. 4, 1716, 2013). However, due to their nanomaterial nature, it has proven impossible to solve their structures by means of traditional x-ray crystallography. Atomic pair distribution function technique (PDF), on the other hand, is a tool of choice probing the local structure of nanomaterials. 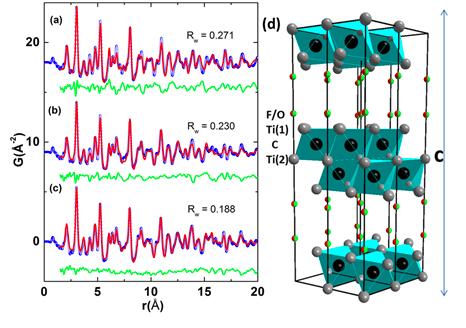 In a recently accepted Physical Review Letter (112, 125501, 2014), current graduate student Chenyang Shi, in collaboration with a team of researchers from Prof. Gogotsi’s group at Drexel University, experimentally determined the structure of first produced and mostly studied Ti3C2 MXene. They investigated the charge transfer upon intercalation of Na+ and K+ ions based on synchrotron x-ray total scattering data. This result would be foundational for understanding the physical properties of these materials and possibly facilitating future device applications. Previous Post Cobalt catalyst work highlighted in “Tribology & Lubrication Technology”!